Outside the Rain is a crime thriller set in Manchester with a hard political edge. The heroine, Detective Chief Inspector Sara Hoyland is at the city's Piccadilly station when terrorist bombs rip through the station killing scores of people, including her own sister-in-law. I wrote it at a time when agents from one country were found conducting clandestine operations in another that broke just about every international law there is. Particularly when that other country is a known ally of the country where the operations are taking place. Manchester too suffered a terrorist attack in 1996. That time though the bombers were transparent and easily identified. 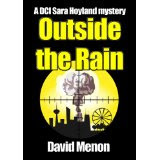 In 'Outside the Rain' you don't really know who the terrorist is until Sara pushes the boundaries with her bosses and the establishment. The story will leave you wondering just who can be defined as a terrorist in this ever complicated world and can we ever trust anyone, even those who are supposed to be on the same side?